Discovery, Description, Characteristics of Oldest Prehistoric Art in Namibia. or patination on each slab. The Apollo 11 Cave is one of the oldest sites of prehistoric art in Africa. Situated in the Huns Mountains of south-western Namibia, it was named after the Apollo 11 spaceship in July 1969, by the German archeologist Wolfgang Wendt, who led the team of scientists and researchers that excavated the cave. The cave is famous for containing some of the oldest mobiliary art ever found on the African continent: namely, seven small stone slabs decorated with charcoal and ochre images of animals. The presence of charcoal in the sediment surrounding the painted stones was carbon-dated to 25,000 BCE, making them the earliest art in Africa after the Blombos Cave Engravings (c.70,000 BCE) and the Diepkloof Eggshell Engravings (c.60,000 BCE). To see how the Stone Age engravings in the Apollo 11 Cave fits into the development of cave art elsewhere, see: Prehistoric Art Timeline (from 2.5 million BCE). The Apollo 11 Cave is located at the juncture of the Orange and Great Fish Rivers in the sparsely populated Karas Region of Namibia, roughly 250 kilometres (160 miles) southwest of the regional capital Keetmanshoop. In the language of the local Nama or Hottentot people, the district is known as "Goachanas". The painted stones were discovered in one of the oldest archeological layers which made up the floor of the cave, and were subsequently dated to between 24,300 and 26,400 BCE. (Note: According to the Smithsonian Institute in Washington, the cave layer in which the oldest Apollo stone was found was dated to between 60,000 and 40,000 BCE.) There is no firm evidence that the slabs were part of the original walls or ceiling of the cave, and it is possible they were simply loose stones brought from elsewhere. The Apollo 11 Cave is easily the oldest prehistoric site found in Namibia, to date: compare, for instance, the Oryx kill site (10,800 BCE), the Hing-Hais site (6,500 BCE) in the central Namibian desert, and Masari (c.3,000 BCE) near Rundu in the far north-east of the country. Note: The difference in age between the rock art found at the Apollo Cave and the Diepkloof Shelter is due to several factors. 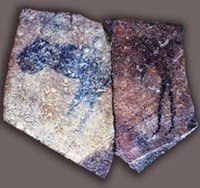 First, although anthropologists believe that "modern man" learned how to paint pictographs and engrave petroglyphs whilst still in Africa - that is, before he arrived in Europe around 40,000 BCE - the history of Paleolithic art in Africa remains unclear, not least because many archeological sites have yet to be discovered. Second, unlike the early Stone Age art in Europe much of which was created in deep caves, often subsequently sealed by landslide - see for instance the Chauvet Cave paintings (c.30,000 BCE) - most ancient art in Africa was created on exposed rock walls. A high proportion have therefore vanished as a result of erosion. Third, like Aboriginal rock art in Australia, early African rock engravings are difficult to date using standard carbon-14 (radiocarbon) dating methods. So even though many experts believe that African art originated during the Middle Paleolithic, perhaps as far back as 70,000 to 100,000 BCE, new cutting-edge techniques like Optically Stimulated Luminescence (OSL) and Uranium-Thorium testing (U/Th) are needed to provide the necessary scientific evidence. The oldest stone slab (pictured above left) was found in two pieces, both buried in domestic debris. In all, a total of seven grey-brown quartzite stones were unearthed, decorated with paintings of animals like zebras and rhinoceroses. Colour pigments used included blacks (from charcoal), reddish hues (from a variety of ochre clays) and white (made from kaolin). In addition to the slabs, the Apollo cave contained a quantity of cave painting, featuring red and white pictures of abstract signs and symbols as well as bees. These works, made by San tribesmen, are believed to date to about 8,500 BCE. A number of rock engravings were also found on a large limestone boulder located some 150 metres from the entrance to the cave. These stone drawings, made by Khoekhoe settlers, include depictions of animals as well as abstract patterns, and are believed to have been made during the first millennium CE. The oldest art in Africa may date to 100,000 BCE. This theory is supported by the excavations of archeologist Chris Henshilwood and his team in the Blombos Cave, South Africa. In addition to the cave's engravings referred to above, Henshilwood also found a 100,000-year-old paint workshop, with evidence of pigment preparation and processing, showing that early "modern man" (Homo sapiens sapiens) had developed a knowledge of chemistry as well as the organizational skills to plan ahead. Similar signs were discovered in a rock shelter in Zimbabwe's Matobo Hills south of Bulawayo, where archeologists found prehistoric colour palettes with paint dating to 40,000 BCE. However, in both cases the pigments might conceivably have been prepared for use in body painting or face painting, rather than rock art. Northern Cape Province, South Africa. Major site of African Mesolithic art. Lottering River, Western Cape Province, South Africa. Rock engravings of elephants, antelopes, crocodiles and oxen. Large-scale engraved and painted images of female figures.  For more about African artworks, see: Tribal Art.  For the oldest Australian art, see: Nawarla Gabarnmang Charcoal Drawing.  For more about cave painting and engraving, see: Parietal Art.  For more information about prehistoric rock painting in Africa, see: Homepage.